Video Volunteers program, strategies used by organizations in response to the disaster in Haiti, a grantee's story about using social media effectively, information about using mobile giving as a non-profit, an announcement about YouTube for Non-profit's recent launches and a quick reminder on keeping your grant safe from phishing. YouTube's Video Volunteers program has been underway since last summer and has been put to work by many organizations that needed outside video-making talent to showcase their cause. In this piece on CNN.com, The Los Angeles Regional Food Bank and a Toronto-based film-maker/philanthropist show how an unlikely pairing made through YouTube's Video Volunteers can result in success for everyone involved. And YouTube for Nonprofits is now available in Canada and Australia, in addition to the US and UK! During and since the recent disaster in Haiti, organizations around the world have been employing social media in different ways to serve their constituencies and the people of Haiti. This article from NetSquared's Amy Ward, describes how mobile phones are a key player in how we react to and provide service during global disasters, including mapping, fundraising and missing persons strategies. Learn more about using mobile giving for your organization at Mobile Giving, the mGive Foundation and MobileActive. Mercy Corps, an international relief organization, was an early adopter of social media but had seen little effect from all of their efforts until they determined that the way to reach their constituents was to extend the strategies deployed on their website to the different social media outlets. In this blog post on NTEN.org, Roger Burks of Mercy Corps, talks about how they have made social media start working for them. We've posted before about the dangers of phishing and how to keep your account safe, but it bears repeating. This series from the Trust and Security team here at Google can help you avoid phishing and keep your account safe. Here's some AdWords-specific information that's good to keep in mind with regard to phishing emails that may appear in your inbox. If you come across resources that would be useful to the greater non-profit community, feel free to post it to Non-profit and grantee resources topic in our discussion forum so that everyone can benefit. If you'd like to review previous round-ups, just click here and read through previous months' round-ups or search for "resource round-up" from the search box at the top of the page. This month's resource round-up includes a success story from YouTube's Video Volunteers program, strategies used by organizations in response to the disaster in Haiti, a grantee's story about using social media effectively, information about using mobile giving as a non-profit, an announcement about YouTube for Non-profit's recent launches and a quick reminder on keeping your grant safe from phishing. , we'd like to offer a brief series on the new interface that has taken account management to a new level, making advertising online a lot easier for you. To begin with, think of the new interface like an online version of AdWords Editor, the free application that enables you to make multiple account changes while you are offline. The left-side panel has a tree view of your account, branching out into campaigns and ad groups. You no longer have to load entire pages to view specific ad groups or campaigns, thanks to this new layout. The tabs have changed too. You now have the ‘Home’ tab that gives you a quick and easily accessible overview of your account—from campaign and keyword performance metrics to a search box for help, alerts and announcements. 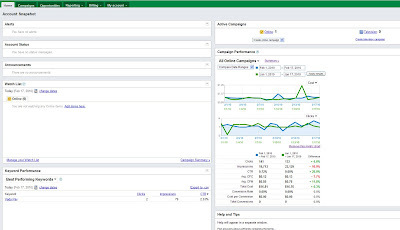 The ‘Campaigns’ tab (instead of ‘Campaign Management’) has a detailed view of your online campaigns. You can click into any campaign for which you wish to see all metrics, such as keywords and bids. The next tab, called ‘Opportunities’, is new; it lists areas of opportunity that might help your online campaigns perform better. This may include budget suggestions or new keywords that are relevant to your account but not already included in your list. This tab also shows all the tools that you can use to track performance and tap into more opportunities. The ‘Reporting’ tab does just that: give you different options to keep track of your account’s performance. This means that it also includes the link to your Google Analytics account, if you have linked one. The Report Center’s various report templates are also listed under this tab, and you'll find the ‘Change History’ tool, Website Optimizer and Conversion Tracking data here too. The ‘Billing’ tab includes billing preferences and the billing summary page. For our Google Grants advertisers, there is no charge, so this tab will not be as important to you. And finally, the ‘My Account’ tab includes Account Preferences, Account Access and Notification settings. The new interface offers a tremendous amount of opportunity with its advanced reporting options, filter applications, graphical representations and in-line editing that renders changes instantaneous. The account navigation is now easier, quicker and more intuitive. In our next post, we'll provide a more detailed look at the ‘Campaigns’ tab to see how it can make your account management process more efficient. Savvy advertisers have been gaining mastery of the new AdWords interface now that it has been around for a little while. To help you take advantage of the new layout and features, we'd like to offer a brief series on the new interface that has taken account management to a new level, making advertising online a lot easier for you. response to the Haïti Earthquake. In order to provide them with more effective support, many Google Grants volunteers got involved and offered up some helpful tips for managing the increase in traffic. Across countries, these volunteers helped more than 60 organizations by implementing Haiti support campaigns with customized optimizations. A few of the organizations involved included the Red Cross, Save the Children, Direct Relief, Habitat for Humanity, Unicef, CARE, Plan, Oxfam and many others. Traffic increased significantly for these organizations, and help from Google Grants volunteers allowed them to leverage their Grants AdWords accounts to raise funds, recruit volunteers and reach their objectives. We'd like to share a few of the most useful AdWords tips for any organization involved in relief efforts so that you can help your organization effectively manage your campaigns in similar situations. Many of the non-profits in the Google Grants program are still taking part in the relief efforts in response to the Haïti Earthquake. In order to provide them with more effective support, many Google Grants volunteers got involved and offered up some helpful tips for managing the increase in traffic. Have questions, want answers? Bring them to the forum! "Why am I prompted to enter payment information when building my Grants account?" "Are non-501(C)(3) organizations eligible for the grants program?" "How long does the application process take?" the ability to designate especially helpful forum members as "Top Contributors"
If you have a question, suggestion or just want to mix and mingle, we welcome you to "stop by" our forum. Googler "Handy Annie" will check in from time to time to answer questions, listen to feedback and highlight great responses and the people who provided them. In a continued effort to find scalable and efficient ways to support our growing Grantee base, we've begun to rely on our User-to-User Discussion Forum. This forum acts as a way for Grantees and non-profits to discuss the Google Grants program and all of its components, including the application process, the AdWords account creation and account review process, and how to best manage an AdWords account after activation. as they come in on our website, too. If your organization is using direct mail or other off-line methods of fundraising, try using your Grants AdWords campaigns or YouTube for Nonprofit channel as well. Carrying the same message in a variety of media outlets helps extend your message to a wider audience. If you're trying to secure donors and support for smaller programs, you can leverage your grant's ad dollars until these programs are robust enough to justify separate marketing budgets. We hear this often amongst our savviest AdWords users, whether they be paying advertisers or grantees: test, test and test some more. Some grantees are now testing deep links on their sites by adding these to their ads and taking users directly to the deep-linked content to see how well they perform against more general landing pages. It's also common and useful to test varieties of keywords, especially low-volume but high-converting keywords to see where you can get the most bang for your buck. Try sorting your keyword list by CTR to see which terms convert at a high rate and then dedicate a higher CPC to these terms to increase traffic. You can also try creating new iterations of these terms for your account to see if you can take advantage of additional high-converting traffic. It's also likely that these are terms unique to your organization, so there will be less competition. Set goals based on what your org sees as success and measure your account's performance against these success goals regularly to see what's working. For instance, if you're trying to increase awareness around a new program or resource you provide, take a look at the current traffic coming to this section of your site and set a goal to increase that traffic (or even clicks on that section) by a specific percentage. Then, as you create new campaigns for this new area, make sure to watch progress toward your goal. Make changes and test different approaches as you go. Just because one part of your site or organization is using AdWords or online marketing effectively doesn't mean they all are. Take techniques and strategies from your existing AdWords campaigns (like CTR goals, successful calls-to-action, keyword building strategies) to organize content from across your website and then build other AdWords campaigns accordingly. Sometimes an AdWords or online marketing expert doesn't already exist inside your organization, but they are definitely out there! Recruit a specially trained volunteer, or someone with a keen interest in online advertising, to make the most of your grant and get them to actively manage your campaigns. The new Intelligence feature in Google Analytics (free) does all the monitoring for you and then lets you know when to pay attention. So, you just set up alert thresholds and when your account hits them, you get an email alert with the details, prompting you to check in to your account and make the smart changes that will help you hit your goals. For example, if you have the goal to increase new visitors to a lesser known part of your website, you can set an alert with Intelligence in Analytics to let you know when this landing page receives an increase in visits of, say 25% or more, compared to the previous day. Then you can check your account and pat yourself on the back - success! Determine the marketing challenges of your organization and seek out the right tools to help you meet them. There are lots of Google resources and tools for different types of challenges. Some favorites are this blog for non-profit best practices and products, the Keyword Tool for finding new keywords based on your website's content, and the Grants discussion forum for questions you have about your Grants AdWords account. Check back each quarter, or better yet, add our RSS feed to your reader or Gmail inbox, to get the latest in AdWords expertise from non-profits around the globe. If you've had a recent success with AdWords or Grants that you'd like to share, please visit our discussion forum to share with other grantees right now or share the story with our team here. This quarter we got an impressive collection of best practices offered up by grantees who are really making the most of their Google Grants AdWords accounts. You can check out more grantee success stories as they come in on our website, too. "Learning to Use and Maximize Your Google Grant." This three-part series, hosted by NTEN.org, covered the basics for new Google Grants organizations, helping attendees to learn more about Google Grants and how to most effectively use your AdWords account to meet your organization's goals. The final session in the series, "Maximizing Your Google Grant to Attain Your Advertising Goals," was led by Mahin, one of our AdWords specialists who has volunteered with the Google Grants program for several years. In the webinar, Mahin shared top tips and best practices for optimizing your Google Grants AdWords account, including strategies for campaign structure, ad groups, ad texts and keywords. One of the main takeaways from the webinar was to test out new keywords and ads, using the strategies covered, and then track their performance and make changes as needed to maximize your account. The best practices Mahin covered are useful not just for beginners, but also for any grantees looking to improve their account performance to increase volunteers, donations, event attendance, and much more. If your organization falls into this category (and we bet you do! ), we strongly recommend reviewing the slides from the session here. If you are interested in the audio recording from the webinar, you can purchase it here. We're also happy to announce that we will be holding another webinar series with NTEN.org starting on February 25th. This four-part series is titled "Maximizing Your Google Grant To Meet Your Organization's Goals" and will be focused on more advanced and savvy Google Grants organizations. If you're interested in attending this series, or any of its individual sessions, please visit the NTEN website for more information and to register. Last week, we concluded our webinar series for Google Grants beginners called "Learning to Use and Maximize Your Google Grant." This three-part series, hosted by NTEN.org, covered the basics for new Google Grants organizations, helping attendees to learn more about Google Grants and how to most effectively use your AdWords account to meet your organization's goals.